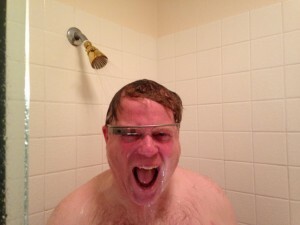 Whatever the next incarnation of Glass, it looks pretty clear there will be one. And that’s rather surprising given how little general consumer interest Google managed to drive for the first wave of Glass. Indeed, it managed to inspire the polar opposite sentiment among non-nerds — generating a pejorative descriptor (‘Glassholes’) to describe wearers of the gizmo. Not a great start then. Next, at a cheaper price-point, and generally designed as more of a crowd-pleaser, there’s Google Cardboard. Announced in June 2014, this is Google’s budget VR headset. It’s literally made from cardboard and a couple of lenses — just pop in your smartphone, fire up the Google cardboard app and experience a degree of immersion within various digital arenas, including Google’s StreetView virtual world tour and 360 degree YouTube videos. Google has also worked with GoPro on a VR rig to encourage the capture of 360 degree content exclusively for “high profile YouTube celebrities” who maintain a large number of followers. Cardboard is a low risk bet for Google to try to drum up mass market interest in VR, and an equal and opposite push to try to get more people making content for VR by building a market for such content. Content, like cardboard, is cheap yet critical if VR is to become anything close to mainstream. And then there’s Google’s moonshot bet in the category: Magic Leap . Google is an investor in the AR company that has yet to release any products but continues to attract vast amounts of VC funding. Just this week it emerged Magic Leap is raising an $827 million Series C funding round — which brings the total raised since it was founded back in 2010 to around $1.4 billion. Sure it’s not Uber levels of funding. But for a company not yet really explaining its product — let alone selling anything — it’s pretty stand out. Mountain View is one of multiple investors here, but Google’s Sundar Pichai also sits on the Magic Leap board. And Google led a $542 million investment round in the company last year. So it’s actively spearheading the funding drive. Discussing Magic Leap this March, Pichai said Google sees broad use-cases for the augmented reality tech, stressing it sees much wider applications than mere gaming. The tech itself remains under wraps but will reportedly rely on some kind of lightweight wearable, and — unlike Glass or Cardboard — won’t involve looking through or at a screen. The founder of Magic Leap, Rony Abovitz, has talked about a “dynamic digital light field signal” which apparently tricks your brain into thinking whatever digital object it’s seeing is actually embedded into — not pasted onto — the real world. He’s also talked about Magic Leap turning the world into “your new desktop” or “your new silver screen”. And creating a kind of “cinematic reality“. Frankly it’s a pitch that sounds tailor-made to get Google salivating. The latter’s motivation to invest in VR is clear. Web advertising is embroiled in a tricky transition to mobile devices where ads on small screens are always an unwelcome irritant for device users. Add to that, more of people’s attention is being siloed into apps anyway, rather than directed at general web browsing. And if all that wasn’t bad enough, the specter of ad blocking is rearing its head on mobile too. Google is staring at a seismic shift in digital consumption that threatens to undermine its core business model. As connected mobile devices continue pulling people’s attention away from the search-driven web, Google really needs a way to bring a wider web back into the frame — and an ability to insert artificial content into a real-world view is a tantalizing prospect for the company. One which envisages an opening up of the digital display canvas again, with space for marketing messages to stretch their legs again. Hence Google betting on VR from all angles: big (Magic Leap), budget (Cardboard) and business-oriented (Glass). From a consumer point of view, if you thought virtual reality was going to be all flying whales, adorable robots and slayable zombies magically manifesting in your living room, think again. The big entity driving developments here is a company whose overriding interest is finding new ways to insert adverts into your field of view. So Magic Leap’s greatest trick might actually turn out to be an ability to camouflage advertising as something that engages the eye for long enough to disgorge a marketing message. At least that’s what Google will be hoping. But if consumers hate adverts interrupting their web browsing or mobile usage, it seems unlikely they’re going to be delighted by ads jumping directly into their eyeballs. Web users reserve a special kind of hatred for pop-ups. So even 3D lifelike pop-ups aren’t about to get a pass. Especially as the VR user will undoubtedly be hoping to see something a lot more entertaining than an artificial polar bear that pops open a Coca Cola. Or a virtual clown pointing across the street at an actual McDonalds. All three of Google’s ‘disruptive’ VR bets will only be as effective as the length of time they remain wrapped around wearers’ eyeballs. So if advertisers have their wicked way with this tech, any ‘honeymoon period’ for the kind of hyper immersive augmented reality Magic Leap is apparently cooking up could turn out to be very brief indeed.